The site now occupied by Zaragoza has been an uninterrupted human settlement for more than two thousand years. The city has changed its name during the course of history being called Salduie, Caesaraugusta, Saraqusta and finally Zaragoza. • To maintain and restore the existing historical and architectural heritage. • To contribute to the maintenance of the existing population of the historic quarter of the city. • To attract new inhabitants so as to widen the social spectrum. • To reinforce social cohesion with actions focused on different social groups. • To promote the historic quarter as the centre of the city with activities for those living in the quarter itself as well as any other people interested in it. • To improve the urban panorama as a whole providing cultural centres with activities that favour social interaction and knowledge. • To promote the added value of the historic quarter as a tourist product integrating possible and actual routes for tourist visits to interesting cultural elements. • To alleviate the shortage of cultural facilities of the quarter by creating small centres to meet large needs. Systematic archaeological excavations in the historic quarter of the city have revealed architectural remains mainly from the Roman era. These have been preserved and included in a route which follows the varied historical remains, and many have become historic on-site museums belonging to the council. The Museum of the Forum of Caesaraugusta, which was openend in 1995, displays the archaeological remains discovered in the 1988-89 excavations, including a typical market from the time of Augustus and the later forum of the city, from the era of Tiberius. displays remains of the main public thermae of the city, found between 1982 and 1990. The Museum of the River Port of Caesaraugusta opened his doors last year. 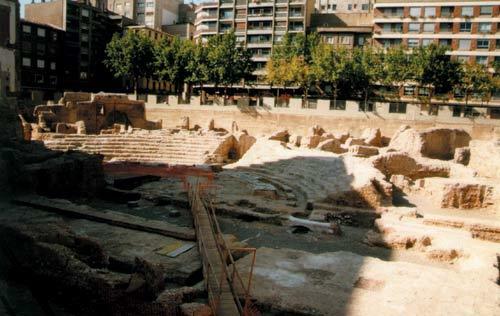 It contains the remains found between 1988-91, mainly the building that connected the forum with the river port. The Museum of the Theatre of Caesaraugusta consists of a building that contains the archaelogical remains found in the excavations of the site and the architectural remains of the theatre over an area of more than 6000 m2, being the best preserved Roman monument of the city. It is currently under construction. The 'Walls of Caesaraugusta' are several visible stretches of the walls of Caesaraugusta that have been preserved, dated from the 3rd century AD. Museum projects for its interpretation have been planned around the two most important stretches of wall. Located in the old convent of San Agustín, this centre has been developed within a municipal project that is now being carried out. This centre will be a fundamental element for the preservation, understanding and promotion of the historical heritage of the city and its evolution, to which we can also add tourist potential -as a reception centre for visitors- and its social influence, as it will add further social, economic and cultural life to the quarter of San Agustín- Tenerías-Magdalena-. Its facilities will be located in a new building, which occupies the former site of the church of the convent of San Agustín, incorporating and highlighting original elements from the different historical phases of the building (16th to 18th centuries). The History Centre of Zaragoza is also conceived as a dynamic centre that will not just display the city's heritage, but will also organise exhibitions and didactic and social activities, as it is conceived as a changing and open cultural resource, even outside the museum itself, by incorporating other buildings with specific themes. 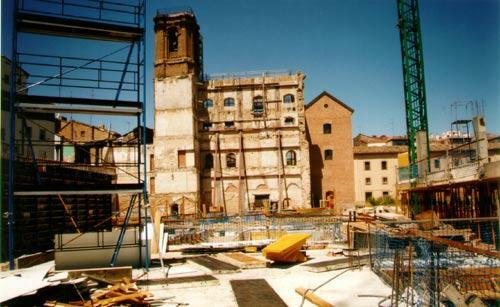 This is the case of the facility 'The sieges of Zaragoza, Zaragoza site for peace' which restores part of a historic building, the 18th century Palace of Lazán. Located in the old pontonier barracks ('Cuartel de Pontoneros'), a neo-classical 18th century building in Madre Rafols Street, the restoration work is currently coming to an end and it is planned to open at the end of 2001. The Regeneration, Preservation and Restoration Centre will have several sections with specific specialities: Restoration laboratories for objects, storage for objects belonging to the cultural heritage which are awaiting treatment, exhibition halls, rooms to hold specialised couses in restoration, educational and other activities related to the labour market, a library and a documentation centre on the city's heritage. The aim is to bring together and co-ordinate in a single building all the regeneration, preservation and restoration activities related to Cultural Heritage. As well as the work mentioned, the centre will also hold training and specialised courses, workshops, employment schemes, etc. This centre will be open to co-operation with different organizations and institutions so as to promote heritage preservation activities, not only those exclusive to the town council, but also activities and programmes planned by the town council in agreement with different public institutions or by any public or private institutions which are or may be interested in the cultural heritage of the city. The town council of Zaragoza has restored a 15th century residential palace at 32 Las Armas Street, turning it into a Municipal Music and Dance School. This building, located in the San Pablo quarter, i.e. in the medieval expansion area of the city, is one of the only remaining palaces from that time in Zaragoza. The characteristic elements of the palace that have been preserved are the facade, the wrought iron on the ground floor and the coffered ceilings of the noble floor, and the patio, which still has some of its original 15th century elements. 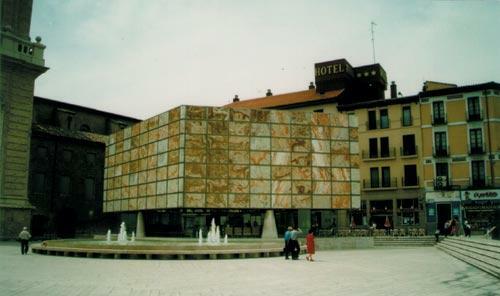 The building was acquired by the Council of Zaragoza in 1997 to convert it to cultural uses for the San Pablo quarter. The renovated building has three floors and a basement and a total of 9 classrooms, an assembly hall and offices. The building is planned to open for the 2001-2002 academic year. This project intends to enhance the character of Las Armas Street as an artistic and scenic arts location, a place of community interaction for the quarter, the historic area and the whole city. It is also intended to attract people to live in this quarter. The project of the Museum of Fire and Firemen, located in the old Convento de Minimos de la Victoria of the Order of San Francisco de Paula, located at Pignatelli Street, intends to display a facet of our history that is little known in Aragón and generally over the whole of Europe. 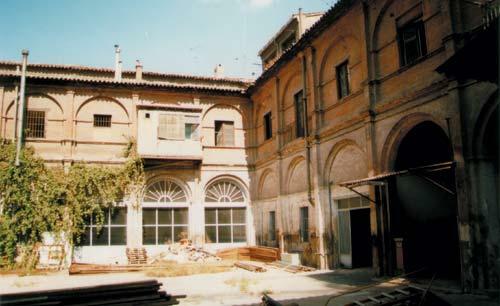 A single building has been chosen, not only for its historical and artistic importance (a fundamental example of 16th to 17th century transition architecture), but also because it revives one of its ancient uses as customs house (preventive prison), fire station and municipal school, returning to the old building part of its historical functions as museum. The museum contains all sorts of displays related to fire, but it does not intend to be just a collection of objects; it also explains their use, properties, characteristics and, above all, their relation to man in the scientific development of the creation of fire and fire fighting. The project is currently on the drawing board and it intends to redress the lack of cultural facilities of this area by creating an attractive cultural location as well as intending to combat the decay of this area.